Towards the end of 2017 I had the opportunity to make a visit to the Democratic People’s Republic of Korea – the DPRK (more normally referred to as ‘North Korea’ in the capitalist countries). As many people will be aware travel in that country is not as easy as it is in other parts of the world so I was on a pre-planned, organised tour. To that tour I added a three day, private, individual tour where I was able to negotiate my own itinerary – within limits. So I was there for a total of twelve days as a tourist. There was no official, governmental involvement and the impressions and observations (with a little bit of up to date practical information) are made based on my experience of travelling quite extensively in other parts of the world and with a world view that tries to understand those societies and cultures I have had the privilege to encounter. In my visits to other countries – especially, but not exclusively, in Africa, Asia and Latin America – I have tried to understand how those societies work (or don’t) and how I see the people within those societies. On previous occasions I have spent many months in some countries so a period of less that two weeks is not enough time to get to know a place. However, as ignorance about the DPRK is rife throughout the western world I consider these observations and comments to be part of a debate – a debate that should be happening (but isn’t) when the drums of war are resounding around the world. Those drums are drowning out any real discussion, any attempt to get to know anything about the country or its people. 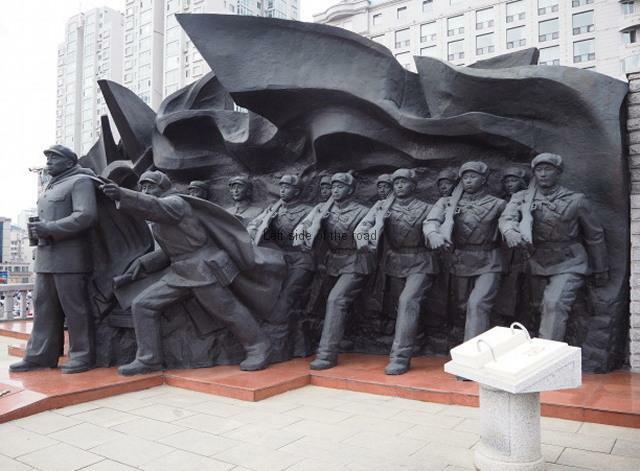 Before entering the station spend some time to have a look at the magnificent, red stone statue of Chairman Mao which stands in the square in front of the main entrance to the building. With his right arm raised in a salute he seems to be greeting the rest of the country from one of China’s most north-westerly cities. I have no information about this statue. 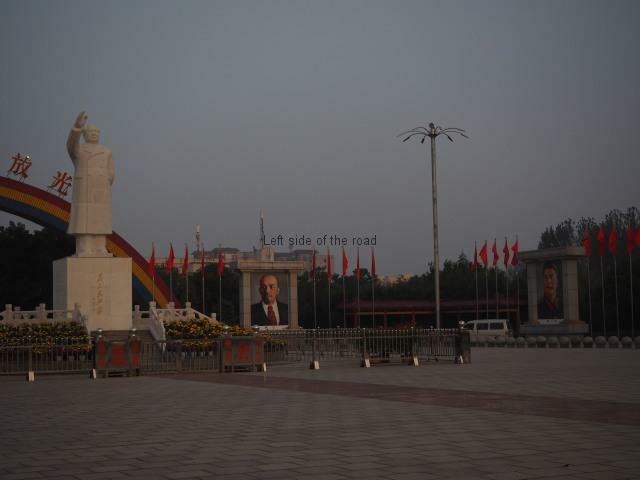 It looks in a very good condition so I assume it is relatively new, or at least one that has been erected after the nationwide victory of the ‘capitalist roaders’, led by the renegade Deng Xioaping. 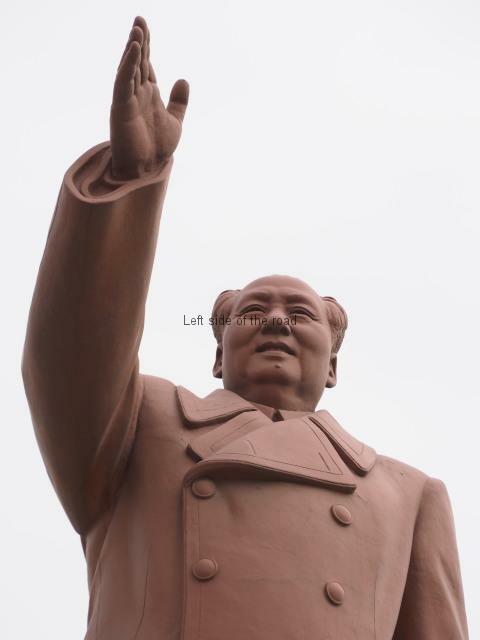 Some cities and locations throughout China are starting to restore monuments that used to exist to Chairman Mao, or even installing them in places where they didn’t exist before. One such notable place is Nanjiecun in Linying County, Henan province. The ‘international’ trains depart from the first floor (English, that is, i.e., upstairs) on Tuesday, Thursday, Friday and Sunday at 09.30. (The overnight train from Beijing is due to arrive at 07.22. Information I’ve seen indicates that there’s a through train but this is not the case. It’s a completely different train that crosses over the Yalu River on the ‘Friendship Bridge’. ) The train leaves from the same platform as the waiting room (which has a small duty free) and normally consists of three, ‘hard sleeper’ carriages – that is carriages with compartments that are designed for up to six people. There’s also a baggage compartment and a travelling generator that sits behind the engine. For reasons I don’t understand almost everyone gets to the station hours before the train is due to depart, end up shoving and pushing to go through immigration and customs only to then wait around for the train to leave. Probably one of the reasons for the scrum is that some people travel with a vast amount of luggage which gets wrapped up in plastic sheeting and placed in the luggage van. At least the luggage is not too much of a problem in the passenger section of the train. Tour companies will tell you to get there an hour before departure but don’t do so any earlier, you’ll just have more time sitting around. After the initial crush the whole area becomes very quiet and you can just sail through immigration. Perhaps arrive at the station, relax and just monitor the situation. Most of the passengers will be returning Koreans or visiting Chinese tourists – a four day tour of the DPRK has become quite popular with Beijing based Chinese people (but, again, that might change with the demand from the US that China does its bidding and cut ties with the DPRK). If you don’t already have (or have lost) a Departure Card they are available on a desk, on the left hand side, after passing through the metal detector and X-ray machine for luggage but before the passport control booths. If all paperwork is in order it’s a relatively painless process. Even though I reject all the hype and the scaremongering that is associated with travel to the DPRK it still gets through to you and there’s an element of apprehension as you prepare for a visit to the country. 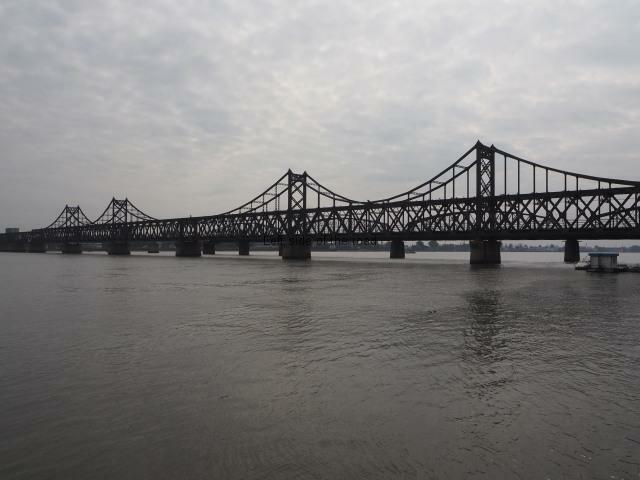 Choosing to arrive by train means leaving from the Chinese border town of Dandong, crossing the Yalu River and after a very short, but very slow journey, arriving in the Korean border town of Sinuiju. However, the heightening of tensions internationally at the moment, and especially as the Chinese are now weighing in on the side of the Americans, it pays to be circumspect when the train arrives at the Sinuiju border post. The ubiquity of smart phones and their ability to take video means that people can be tempted to film the crossing of the river and the arrival at the station. Even though on the Chinese side of the river there are, at least, three separate monuments that commemorate the friendship between the Chinese and Korean Peoples during the War of 1950-53 that relationship is becoming strained now and it’s not wise to put local patience to the test. My approach to why the people and government of the DPRK take the stance that they do I will come back to later. My point here is that anyone who visits the country without at least a basic understanding of the present international situation and how sensitive that makes people in the DPRK – especially government officials – feel are being, at best foolish, at worst reckless. What maybe seen as a mere schoolboy’s prank in the US can take on a greater significance in the heightened atmosphere of the DPRK threatened with imminent destruction – as an American tourist found to his cost in 2017. If the journey across the river is short the stop at the station of Sinuiju would be long, two hours being allowed on the timetable (as well as the clocks going forward a half an hour). Once the train arrived a swarm of officials left the station building who divided themselves up between the three passenger carriages. Apart from these officials the military presence was minimal, a young soldier, not seriously armed, standing at either end of the platform to monitor that no one left the station. In a country where we are led to believe the army are everywhere the first impression was that things are much more threatening on passing through a major airport in the UK than entering the DPRK by land. Although there were a couple of small groups of Chinese tourists the rest of the passengers were Koreans returning home – and us two Europeans. I don’t know how many Europeans/Westerners might choose this route but I wouldn’t have thought many but there was no real impression of surprise when the customs or immigration came to visit. What many people who have not crossed borders by rail won’t understand is that in these circumstances people don’t have to get off the train and parade in a room to get their passports/visas checked and stamped. An immigration official comes along the carriage, compares your face with the photo in the passport, piles them up and takes the whole lot to an office. I assume that if there’s a problem that person might be asked to leave the train but otherwise the next time you see your passport is when it is handed back to everyone, normally just a matter of minutes before the train leaves. The curtness of the customs officer was down, I believe, more to lack of common language than anything else. With the Koreans or Chinese he could communicate in a meaningful manner, with us it was just one word communication – and he seemed more concerned about a mobile phone than anything else. Here it might be useful to mention those things that are, and aren’t, permitted when entering the DPRK. Computers and cameras are no problem whatsoever – he barely looked at mine when I opened my bag. Make sure there’s nothing compromising on your computer hard drive, just in case one of the customs officials is feeling inquisitive the day you arrive. There’s no chance of a wifi connection in the country but, at a price, it is possible to send emails from the communication/business centre that you will find in all foreign tourist hotels. Mobile phones are also not a problem they now being as ubiquitous in the DPRK as they are in most other countries in the world – all parts of the country and not just the major cities from what I saw. However, for visitors so-called ‘Smart Phones’ will function more as a recording device than anything else as roaming doesn’t exist. This ability to surreptitiously film anything might be what is in the back of the minds of the customs people (all men, I didn’t see one female customs or immigration person at the border) but if people want to do so then it’s almost impossible to stop them and the only way would be to check everyone on leaving – and that would be totally impractical, although random checks are made (as I discovered when I left by train to cross over to Russia at the end of my visit to the country. In many ways I understand their thinking but as technology races on it would be like Canute attempting to stop the tide from coming in so a more relaxed recognition of this would make life easier for all. Most regular tourists are there to try to get an understanding of the country – few would be there looking for opportunities to return home to denigrate the country and its people – journalists, on the other hand, are a different matter. I understand it is possible to buy a local sim card but then the question would be why? I think the emphasis on the mobile was to do with making sure people were open about what they were carrying. No point in lying if at any time they can turn out all your belongings – the same as at any other country’s customs. It’s also unwise to take in any religious books or any which criticise the country in any way – that includes guide books which seem to think they have the right (if not the obligation) to churn out the same propaganda that comes from their respective governments and media. As an aside it’s always amused me that there are certain countries in the world where guide book compilers seem to think they should make some sort of comment on the society – normally the same propaganda churned out by their respective country’s governmental departments or the ‘facts’ reproduced in the biased media. This is especially the case in those countries that have attempted to build socialism – even in countries like China and Vietnam where socialism was ditched in favour of capitalism decades ago. However, you don’t get the same ‘analysis’ of the political situation in countries such as the UK. When reading about Coventry where does it say in the tourist brochures that the city is the home to the biggest and busiest food bank in the country? Where does it say in guide books about the UK that it is the aim of the Tressel Trust (the biggest food bank charity in the country) is to establish a food bank ‘in every town in the country’? They want to perpetuate poverty not eliminate it. Where does it say in guide books to the UK that virtually all major cities, the length and breath of the country, have seen an exponential growth in the number of people who are sleeping rough on the street and the problem of homelessness is becoming a national disgrace? I could go on. This is just another example of the chauvinistic, parochial and xenophobic attitude that is characteristic of arrogant capitalist hypocrisy. More on that later. Returning to the customs check. If anyone was getting any extra attention it was the Koreans who were returning to their own country – the tourists and their luggage just going through the formalities. And that makes sense. Those people more likely to be bringing in contraband of any sort would be those who knew what to do with it once in the country. But even here there was a relaxed atmosphere as it looked like some of the passengers on the train knew the officials as many of them made regular journeys, on business of some kind, to China on a regular basis, as was the case with the two Koreans in our compartment. One thing I did learn, or more exactly had reconfirmed, is that customs officials worldwide don’t like rummaging through rucksacks. Even though they can make you turn out everything if they so wish from my experience they only peek into the top and then give it all up as a bad job. Once the customs had left the carriages and the passports were in the hands of the immigration people everyone relaxed. People started to leave the train and stretch their legs on the platform. When I went to look at the engine (not having had the opportunity in Dandong) it was indicated that I was straying into a place I shouldn’t be going, that is too close to the end of the platform, but there was no hostility involved – the young guard just doing his job. A matter of minutes before the train was due to leave the different piles of passports were carried from the station building and everyone returned to their space on the train – more likely to get their passport back with no problems as they are handed out in the order they were collected. A foreign passport is something of a novelty in a number of places where I’ve travelled and it’s not uncommon for there to be a slight delay in getting yours back as people on the way flick through the pages, both for the document itself, which is often different from their own and also to have a look at any stamps and visas. Some more confident will often come up and ask to have a look and within the confines of a bus or a train that is moving that’s not a possible scam but a genuine curiosity about other people and their travels. Everyone with their passports and no one – to the best of my knowledge – left on the platform the train pulled away from the station, leaving China behind and headed, at a gentle but not too slow a pace, towards Pyongyang, about 5 hours away. This entry was posted in Asia, Democratic People's Republic of Korea and tagged china, dandong, democratic people's republic of korea, dprk, friendship bridge, mao tsetung, north korea, sinuiju, yalu river by Michael. Bookmark the permalink.